The Brazilian art director and designer Bea Feitler (1938-82) said of magazines that ‘you can’t look at one page alone – you have to visualise what comes before and after’. This idea was at the core of an exhibition, the first dedicated solely to the designer, reflecting her achievements at Berlin’s Between Bridges gallery. Spanning her work from the 1950s to her untimely death in 1982, ‘New Picture’ presents across two rooms her work for Harper’s Bazaar, Ms., Rolling Stone and the modern Vanity Fair. Exploring Feitler’s definitive lines, persuasive elegance and dynamic style across a diverse range of cultural artefacts, it becomes clear that such a retrospective is long overdue. Curators Marte Eknæs and Nicolau Vergueiro don’t present one period at a time, but instead lay out materials so that you can visualise the ‘before and after’ of Feitler’s entire career. Eclectic groupings of magazines, books and personal photos from various periods blend together in three display cases, with reproductions of covers of Ms. magazine and Harper’s Bazaar providing the show with its central architecture. In one case, Feitler’s early design for the Brazilian 1960s political magazine Senhor sits alongside spreads from Feitler’s 1970s Rolling Stone collaborations with Annie Leibovitz (who called the designer her first great mentor) and Feitler’s bold prototype for the 1980s revival of Vanity Fair, which appeared shortly after her death. Feitler was a designer who combined references from pop with politics, art and classic cinema with fashion, saying, ‘It doesn’t matter what I make, whether it’s aesthetic or commercial, it all comes from my guts’. The arrangement of the works reflects this sensibility, and brings to attention Feitler’s distinct visual themes: a recurring fascination with the feminine silhouette, an architectural use of typography, an exploration of the centrefold’s gutter as a structural device, and the use of monumental shifts of scale for comic or sublime effect. The most striking element of the show is the way the covers are displayed on the walls, so large that the women in the frames approach life size. The first room displays covers belonging to the uncompromising feminist magazine Ms., while in the second, covers and spreads from the fashionable Harper’s sway from a swinging poster display. Feitler became co-art director of the latter title at age 25 with the similarly young Ruth Ansel and together they brought to Harper’s what they saw on the streets: the brightly coloured dandyism of the newly emancipated young, the kaleidoscopic energy of the shifting political and cultural landscape, spliced together with Day-Glo and brightly coloured paper cut-outs. This display brings the Swinging Sixties back to life. ‘New Picture’ presents a selective history of Ms., bypassing its occasional cultural appropriations in the name of Second-Wave Feminism. It imbues Feitler’s covers with newfound cultural and political relevance, situating the art director in conversation with current feminist projects. The cover of ‘The Beauty Queen Who Wouldn’t’ issue, with its unexpected, sophisticated portrait of a beauty queen, is surely a predecessor of the contemporary art direction of The Gentlewoman, with its candid, intimate portraits of women and rejection of overly sexualised images. 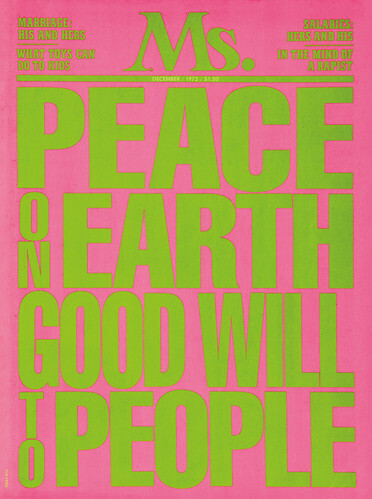 Feitler’s all-type, green and pink Day-Glo Christmas special declaring, ‘Peace on earth good will to people’ (instead of ‘good will to men’) was a sell-out at the time, defying the conventional wisdom that all-type covers are newsstand disasters. 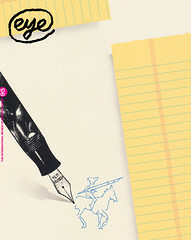 This finds its echo in the magazine Riposte (designed by Shaz Madani, see Eye 92), which from its first issue used all-type covers in an arresting two-tone colour palette. ‘New Picture’ has a two-fold relevance. It brings to the forefront an underappreciated designer at the heart of the ‘golden age’ of magazines whose signature cuts across the look of an era. Without Feitler, we wouldn’t have a naked John Lennon wrapped around Yoko Ono on the cover of Rolling Stone, or White Women by Helmut Newton. ‘New Picture’ also shows Feitler as the crafter of an influential new language, which laid the groundwork for the current search for empowering representation of all genders in the mainstream. Cover for Ms. magazine, December 1972. Feitler brought the bright, Day-Glo colours popular during the 1960s to the magazine covers of the early 1970s, making them all the more striking on the newsstand. Top: Harper’s Bazaar, January 1967. 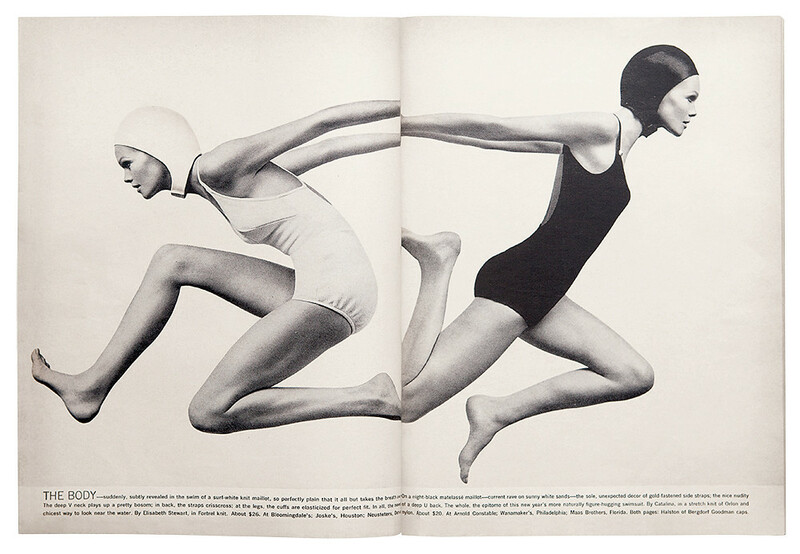 This feature spread ‘The Body’ shows two models wearing nylon and knit swimwear by Jantzen (left) and Brigance for Sinclair (right), photographed by Hiro. Art direction: Bea Feitler and Ruth Ansel. Private collection, Hearst Communications, Inc.